The final report on cultural and theme houses, released earlier this month, has raised the concerns of residents in MIT’s four cultural houses. The report assesses the cultural houses on campus and provides three recommendations for strengthening the programs, one of which is to establish and maintain an academic focus and faculty connection, which the houses are currently lacking, according to the report. MIT currently has four cultural houses — Spanish, German, French, and Chocolate City, all located within New House — with a total of approximately 130 residents. Jason C. Forte ’09, Undergraduate Association senator for New House and resident of Chocolate City, estimates that the cultural houses make up 40 percent of New House undergraduate dormitory. A decline in shared cooking and dining and the sense of community those activities provide, erosion of relationships with faculty and departments, and failure to maintain an academic focus were listed as observations of the cultural houses in the report. Discussion on the report was expected at last night’s UA Senate meeting but was postponed until the next Senate meeting. Representatives from the cultural houses will meet with the Dean for Student Life Larry G. Benedict, who co-chaired the subcomittee that produced the report, on Wednesday to discuss the recommendations and the concerns of the students, said George S. Zaidan ’08, president of French House. The meeting will be hosted by the New House housemasters. According to Zaidan, the cultural houses are in the process of writing a letter responding to the report which will be sent to the subcommittee. “Over the next few weeks, we will work with committee members to plot a constructive path forward,” Zaidan said. The report lists three major recommendations, the first of which is for the cultural houses is to formalize the involvement of a faculty advisor and affiliation with an academic program. The language houses — French, Spanish, and German — originally had connections to language faculty and academic programs. Chocolate City, established with a different purpose than the language houses, has never had an academic or faculty connection, the report states. The second recommendation was geared toward the Housing Office. The subcommittee believes that a process should be developed where a new theme-based community or cultural house could be allocated space. The final recommendation was for the Residential Scholars Program, designed to engage students in community activities, to be expanded beyond Simmons Hall and possibly include theme-based houses. UA Vice President Ruth Miller ’07 said that she is concerned with the tone of this part of the report because she is “concerned that the tone is indicative of larger distrust on the part of the Division for Student Life towards freshmen,” and that it seems to insinuate that freshmen are unable to make choices for themselves. “[This report] could bode even more poorly for the housing system at large,” Miller said. According to the cultural housing report, “international experience” and “global education” were stressed as major goals or themes of both the report of the Task Force on the Undergraduate Educational Commons and the Division for Undergraduate Education. The educational task force report specifically stresses that the “internationalizing missions of the Institute’s international houses” should be bolstered and that “ties between these residences and academic units” should be strengthened. 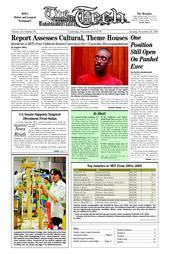 The subcommittee was formed in May 2005 and included housemasters, student representatives from New House, French House, and Dormitory Council, and members of the Housing Strategy Group, was initially asked to submit the final report in May 2006, but additional time was required and the timeline was extended to Oct. 2006. The report is available at http://web.mit.edu/institvte/talk/2006/.